Download DA Form 8015-R, also known as the Filth Fly Survey. 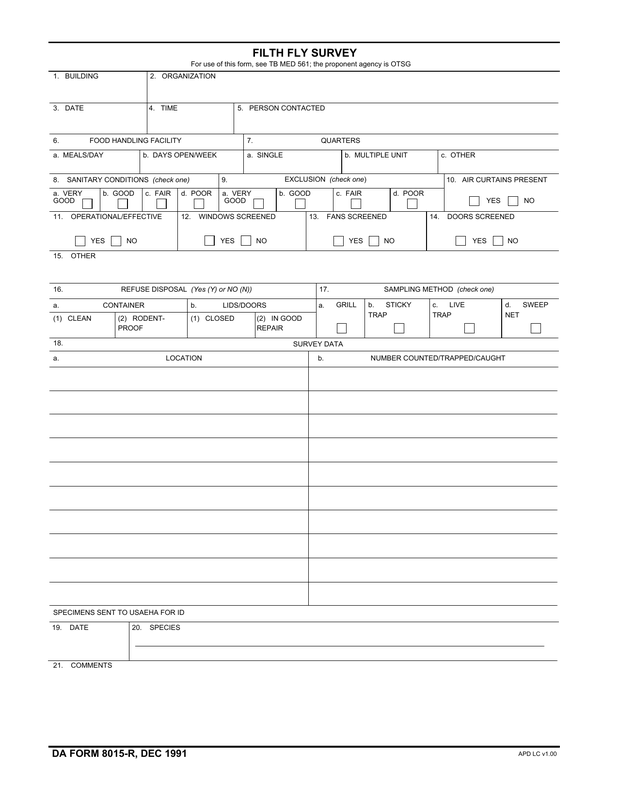 This form is a part of the U.S. Army’s pest monitoring program. Prior to completing this survey, a thorough study of the Filth Fly population in each stated location will be conducted. This form is designed to document successes of the Filth Fly study that will be conducted periodically. The study will be ongoing so that various locations may be controlled or part of the population may be exterminated if the population reaches critical mass and the Filth Fly colonies become detrimental to human health. The survey will assist in determining what success is taking place with the monitoring and possible extermination procedures. Step 1 – Filth Fly Survey – Complete blocks 1. through 15. to establish record for administration. 6. Food Handling Facility (check applicable box a. or b. Step 2 – Survey Data – Section 18- enter required information in columns a. and b. Step 3 – Specimens Sent To USAEHA For ID – Complete 19., 20., and 21.